This topic contains 12 replies, has 4 voices, and was last updated by Hal 3 months, 1 week ago. It is that dangerous and thrilling time of year again, when Feylin sneaks into houses to redistribute nerd gifts around the world and hopefully not steal all your things while she is there. Welcome to the RPGMP3 Secret Santa. Go and read this post for more information on how to sign up and get you some nerd gifts while doing some nerd gifting. OK! Going to close the doors on recruitment tomorrow to give some stragglers time to sober up from Thanksgiving and dive in. Did this ever happen? Running out of posting-time! I will get this done this evening. Apologies. I am away and this slipped my mind until my net was only accessible by phone. Did not want to make mistakes with the shipping info. I’ll post here when all victims have been assigned and gifters informed of their Target locations. All Bag victims have been distributed through the site message system. Please let me know if they do not come through, it seems the system is running a little slower than I would like at the moment. Apologies for the delay. Go shop for geek stuffs. I believe I have gotten my Bag gift, I will post a picture of it on Christmas Day. I have mine as well and it is under the tree awaiting the appropriate moment to tear it open and gorge on the glorious innards. I have not one, but two packages waiting to be opened in a few hours. I am an excite! Thank you to the lovely agent of Feylin that sent along this wonderful gift! How did Feylin know I could use more dice? No time to post pics yet, but I wanted to stop by quickly and say thank-you to Feylin. I have two bags of fun and joy, for which I am very grateful! Played a couple of games of the board game that Feylin left me last night. It is a pretty awesome deck building game that requires some thought and planning. Very cool indeed. 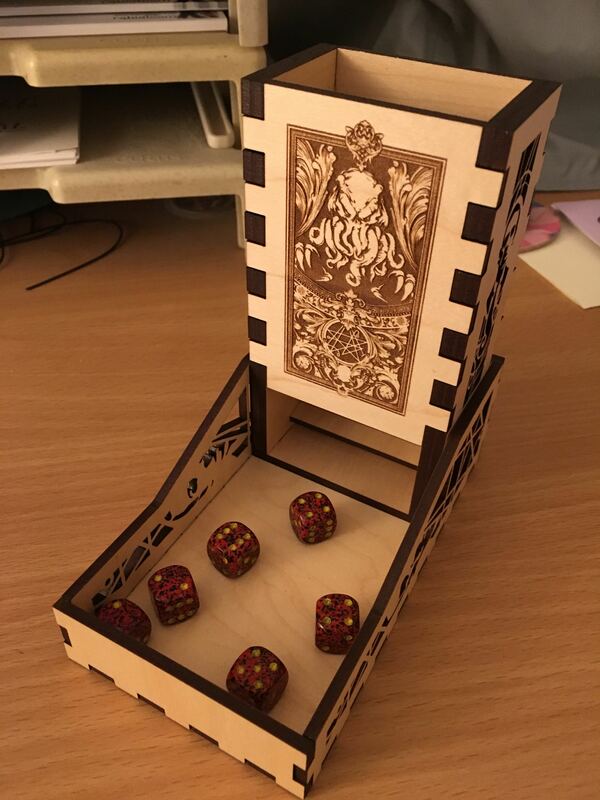 That is a rather nice dice tower. Is that our boy, HP, peeking around from the side?